The motivation for a home improvement project can come from a variety of sources. It often occurs at two ends of the home-owning spectrum: We are spurred on to action either when we decide we are staying forever or when we are getting ready to move. It is unfortunate that so many people wait to tackle home improvements until just before they list their homes for sale. It is sad because they go to the effort to remodel, but don’t get to enjoy the fruits of their labors. However, some projects are necessary and others are a good idea to maximize the value of one’s home. 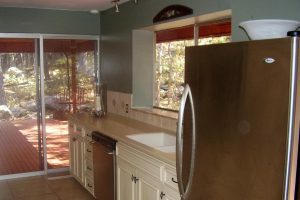 AFTER: This kitchen remodel shows the drastic change a kitchen remodel can make to a home, which translates into resale value and sale-ability. Most of the clients we see are in the “stay forever” (or at least a few good years) category. The clients who come to us as residential architects are changing major portions of their homes — moving walls/doors/windows to reconfigure existing space or adding on new space. Typically, homeowners are not doing this type of remodel as a last-ditch effort to get their home ready to sell. It is not generally cost-effective. In most cases, there isn’t enough time to recoup the remodeling costs through the added value, despite what you see on cable home improvement shows. According to most tables on return of investment percentages, recouping 70 percent of your investment is considered good immediately after a remodel. Very few home improvements instantly recoup 100 percent equity. However, some projects have a better return on investment than others, and some pay off in other ways, such as by attracting prospective buyers and hastening the sale of the home. Thinking of the resale value is smart when remodeling, even when you are not planning to sell immediately. 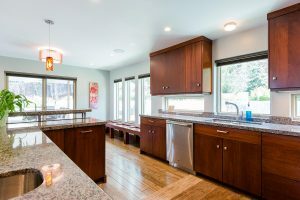 Whether a homeowner is fixing a home up to sell or just remodeling for themselves, it is important to understand what a remodel will do to the value of a home. Here is a list of home remodeling projects that can positively impact home values and appraisals. The appraised value of a home is based on hard numbers — square footage and the number of bedrooms and bathrooms. An appraiser will calculate the market value of your house based on comparable-sized homes in the surrounding area. If you add square feet to your home, it will move your home into a different home value bracket. Adding additional bedrooms and bathrooms will also instantly move your home into a new bracket. While this will add value to your home, adding square footage and bedrooms and bathrooms are costly projects; therefore, the return on investment may not actually be as good as other projects. It generally takes three to five years or more to recoup the money put into an addition. An appraiser also gives you points for having a well-maintained home. The roof, exterior paint, interior paint and finishes that are well maintained will all add value to your house. These are last-minute home improvements that merit more value points in an appraisal. They are typically easy to do, fairly inexpensive and relatively quick. Well-maintained heating and cooling systems, new furnaces, newer siding, hot water tanks and other built-in appliances all add value to your house. A well-maintained home, including the landscaping, adds overall curb appeal to the house, which translates into market value. Paint is one of the go-to projects people often undertake to fix up their house to sell. A fresh coat of paint does wonders for a home. Interior and exterior paint actually falls under the home maintenance category of an appraisal, and an appraiser does take it into account when setting a value on the home. It is important to know that while fresh paint won’t change the appraised value a great deal, it will impact your home’s sale-ability. People generally like a fresh, clean, neutral look, and if they are buying a home, they are likely to choose move-in ready walls over ones that need paint. Updating the kitchen is another value-added project that adds actual value as well as buyer appeal to the home. An appraiser adds value to a home if the kitchen is updated. High-end finishes like granite countertops and custom cabinets impact the home’s value as well as the sale-ability of the house. A kitchen can really sell a house; if a buyer values the kitchen, he or she will often be willing to pay a little more for it. In the end, the cost of a home is what the market will bear — a somewhat subjective guideline. Possibly the best approach is to design well for your situation, without making your home so unique that another family could not benefit from living there. When remodeling, keeping an eye on the possibility of reselling your house will keep your improvements from becoming overly personal and the project cost from losing all contact with reality. We hope you will love your renovation so much that you will want to stay forever, but if circumstances dictate another path, you will be ready to move on with a healthy return on the investment you have wisely made in your property.